Periodontal disease and decay are both caused by bacterial plaque. Plaque is a colorless film that sticks to your teeth at the gum line. Plaque constantly forms on your teeth. By thorough daily brushing and flossing, you can remove these germs and help prevent periodontal disease and decay. If you have any pain while brushing or have any questions about how to brush properly, please be sure to call the office at 206-362-0152. To clean the upper teeth, hold the floss tightly between the thumb and forefinger of each hand. Gently insert the floss tightly between the teeth using a back-and-forth motion. Do not force the floss or try to snap it in to place. Bring the floss under the gum line until you meet slight resistance then curve it into a C-shape against one tooth. Start in the space between the gum and the tooth where you feel light resistance. Shoe shine your way up the side of the tooth away from the gums. Remember there are two tooth surfaces that need to be cleaned in each space. Continue to floss each side of all the upper teeth. Be careful not to cut the gum tissue between the teeth. As the floss becomes soiled, turn from one finger to the other to get a fresh section. People who grind clench or have recession and sometimes after dental treatment, teeth are sensitive to hot and cold. This should not last long, provided your mouth is kept clean. If your mouth is not kept clean, the sensitivity will remain and could become more severe. If your teeth are especially sensitive, consult with Dr. Ebsworth. He may recommend a medicated toothpaste or mouth rinse made especially for sensitive teeth. Ultrasonic and high-tech electronic toothbrushes are safe and effective for the majority of patients. Oral irrigators (water spraying devices) will rinse your mouth thoroughly, but will not remove plaque. You need to brush and floss in conjunction with the irrigator. We see excellent results with electric toothbrushes. Ultreo and Sonicare increase the ability of most patients to get their teeth clean. Some toothbrushes have a rubber tip on the handle; this is used to massage the gums after brushing. There are also tiny brushes (interproximal toothbrushes) that clean between your teeth. If these are used improperly you could injure the gums, so be sure discuss proper use of these brushes with your doctor. If used in conjunction with brushing and flossing, fluoride toothpastes and mouth rinses can reduce tooth decay as much as 40 percent. Remember that these rinses are not recommended for children under six years of age. Tartar control toothpastes will reduce tartar above the gum line, but gum disease starts below the gum line so these products have not been proven to reduce the early stage of gum disease. Whitening toothpastes are more aggressive and can wear the teeth. We do not usually recommend whitening tooth pastes they are not a good substitute for good home care and they are more abrasive. Daily brushing and flossing will keep dental calculus (tartar) to a minimum, but a professional cleaning will remove calculus in places your toothbrush and floss have missed. Your visit to our office is an important part of your program to prevent gum disease and keep your teeth for your lifetime. Not all people require the same type of cleaning. The highly resistant patient, one that is very thorough with personal home care, who does not smoke, and is genetically not predisposed to breakdown will require very little professional help and usually only requires his teeth to be occasionally polished. On the other hand the average patient is not so lucky. Lack of regular care, previous breakdown, difficult access, and bad habits can require 4 or more intense cleanings per year to lessen risks and control the disease process. Each patient has his own challenges and for this reason the maintenance programs for most patients are different. 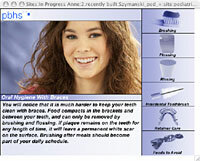 When we polish light stain off the teeth it is called a prophylaxis or prophy. When we plane and smooth the roots under the tissue of patients with gum disease it is called root planning. When gum disease is controlled by a good maintenance program, the cleaning becomes a less intense maintenance procedure. We are beginning to understand the medical connections between periodontal disease and many other diseases like heart disease, stroke, and diabetes and we are finding greater health benefits for a great maintenance program. How often and what you eat have been found to affect your dental health. Eating sweet or starchy foods such as soft drinks, crackers, bread, cookies, and candy supply the bacteria in your mouth with sugars. Bacteria consume and convert these sugars and producing acids, which attack your teeth for up to 20 minutes or more following each bite or sip of carbohydrate rich food. Foods that stick to your teeth or are slow to dissolve give the acids more time to work on destroying tooth enamel. Decay is caused more by the frequency of exposure to sweets and starchy foods than the amount eaten. Nibblers and snackers have the greatest risk. Most of the time cavities are due to a diet high in sugary foods and a lack of brushing. Limiting sugar intake and brushing regularly, of course, can help. The longer it takes you to chew foods and the longer the residue stays on your teeth, the greater the chances of getting cavities.